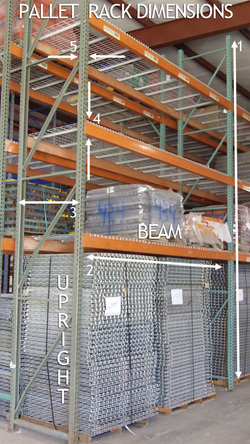 Pallet Rack Dimensions Here is what we need to know in order to make an offer on your pallet rack. We buy complete warehouse storage solutions across the country. The larger the volume of used products available the more likely we will be able to quote your project. If we cannot purchase, we will do our best to help you find a suitable buyer in your area. North Shore Supply Company is a family owned and operated steel service center, structural steel fabricator, and material handling distributor serving the Gulf Coast region since 1955. Our 400,000 square feet of warehouse space including 230,000 square feet under crane is located on over 50 acres. These facilities combined with 30 company owned delivery vehicles enable us to provide our customers with prompt, reliable service. Our export department has considerable experience in preparing and expediting shipments for our many customers throughout Central and South America, West Africa, and Asia. We specialize in in the purchase of good quality, used material handling products. Please submit your products via our online forms along with images, items descriptions, quantities and sizes to ensure a correct bid price. © 2019 | We Buy Rack| All Rights Reserved.